Good design and good sound for a good price is hard to beat. And for many years that very ideology was kept alive by Jays – the sophisticated Swedish headphone maker known for its attention to detail, as well as one of the best three-button remote with a high-performance microphone to ever be designed and integrated into an in-ear headset. Recently Jays introduced the a-Jays Five, the company's new flagship in-ear headphones with a promise to one-up the a-Jays Four by doings things better. But most importantly, the a-Jays Five are Jays most considerate in-ear headphones yet. No longer will iOS users be the only ones to enjoy the greatness of Jays' unique, full-featured inline remote and mic. Whether you're an iOS, Android or Windows user, the a-Jays Five are available in three individual models designed not only to aesthetically compliment each of the three ecosystems, but fully support them natively. We have never seen such dedication from other brands as much as Jays puts effort into engineering three entirely different experiences in order to make everyone happy. It's groundbreaking. Should the a-Jays Five be your next iOS, Android or Windows in-ear headphones with enriched integrated headset functionality? Read our in-depth review to find out if the a-Jays Five are the right pair for you. The packaging is not as over the top as it was before with the whole pod shell design, but then again it is now much much easier to open and quite beautiful still. And depending on the color and mobile OS support model you pick for the a-Jays Five, the packaging will match the details on the outside as well as on the inside. It only goes to show the Jays is putting in the effort so that its customers will feel appreciated. I'm still intrigued by how everything is presented inside the box, and that is always a good thing at the end of the day. Even the included hard pod casing that keeps your headphones protected while you carry them with you has been much improved and is a lot more practical compared to JAYS iconic sphere casing that is included with older JAYS models. Twist to open the lid and you will find the a-Jays Five bang in the middle like delicious candy waiting to be enjoyed. 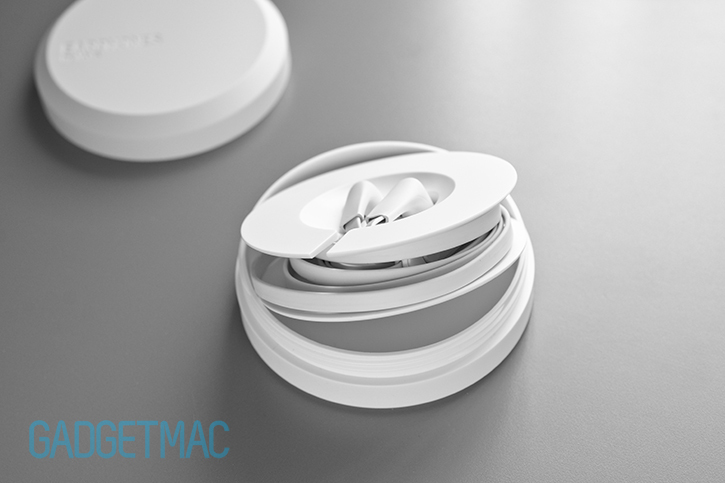 Within the round casing is a removable cable management tidy with the cable wrapped around it in a neat way much like the EarPods storage case. 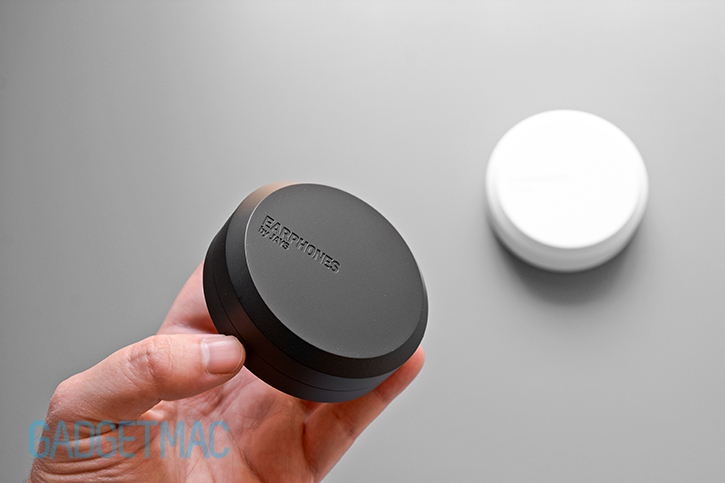 The exterior of the hard casing matches the non-rubbery matte plastic finish of the a-Jays Five remote and mic module. A nice touch and attention to detail indeed. It may take you a minute to wrap the cable around and around just right, but it’s surprisingly fairly easy to do. And with some practice, you’ll never think about it twice. 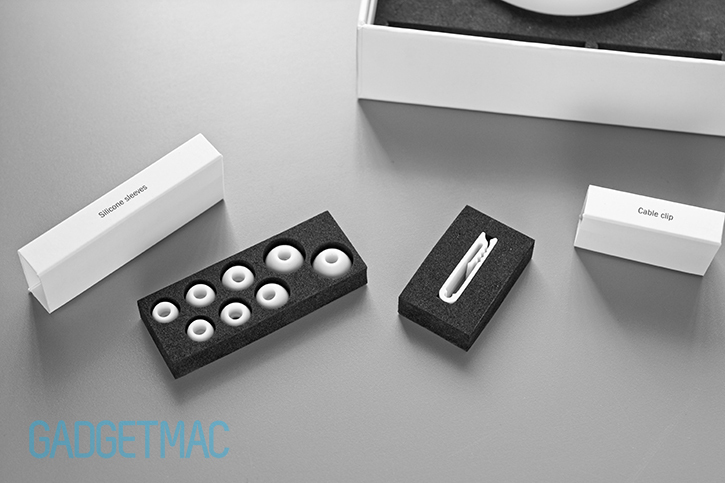 Also included inside neat and labeled sleeved compartments are a number of interchangeable silicone ear tips in various different sizes, as well as a shirt clip for attaching the cable to your body should you find that to be necessary. Finding the correct tip is hugely important in order to achieve the right tight seal inside your ears which will lead to a secure and comfortable fit; as well as optimal bass performance. Jays has come a long way since we last reviewed one of its products a few years back in terms of industrial design. The a-Jays Five are $20 more expensive than their presumed predecessors, the a-Jays Four, coming in at $100. For that extra bit of cash you'll be getting improved durability, broader device compatibility, enhanced ergonomic comfort and even a more refined audio performance. If you've read our a-Jays Four review you would know that we absolutely loved them at the time and everything they had to offer. Fortunately, the a-Jays Five are every bit as good if not better. However, they aren't perfect. At first glance, the a-Jays Five have this sort of pinched shape to them that is different from any symmetrical in-ear headphones Jays has made up until now. I wouldn’t go as far as to say they share a resemblance to Apple’s EarPods, although I definitely see the same type of originality and design beauty, however small, in them. That being said, the a-Jays Five boast a rather understated and simplistic styling with absolutely no logos and branding for others to stare at. In other words they are tastefully bland. Even the black and white theme Jays has been using all these years is still in effect today. Your choice is of color is as it ever was, limited to either white or a black. I'm sure that I wouldn't be the first to say that more color options will be an excellent addition to the line. The a-Jays Five bring an entirely new design that's built from the ground up with a more ergonomic curvature rather than the straight fit of previous a-Jays Four models. The subtle angle means that they enter your ear canal more freely while the cable stem is positioned away from coming in contact with your ear. In practise they are a bit more comfortable to wear compared to the a-Jays and t-Jays series of in-ear headphones, but they're also as comfortable as another note worthy pair of Swedish in-ears – the Nocs NS600. And of course we have compared the two sonically further into the review. Not everyone will agree, but the a-Jays Five are about as comfortable to wear as any lightweight pair of in-ear headphones. I find them to be phenomenally comfortable to wear for long periods of time. Some people will not find the a-Jays Five to be as comfortable as we say they are, while others will agree that their lightweight angled form factor along with a variety of round silicone tips offer plenty of relaxed comfort. Once inside the ear, the a-Jays Five keep a low and unobtrusive profile so much so that you can rest your head on a pillow without any discomfort. 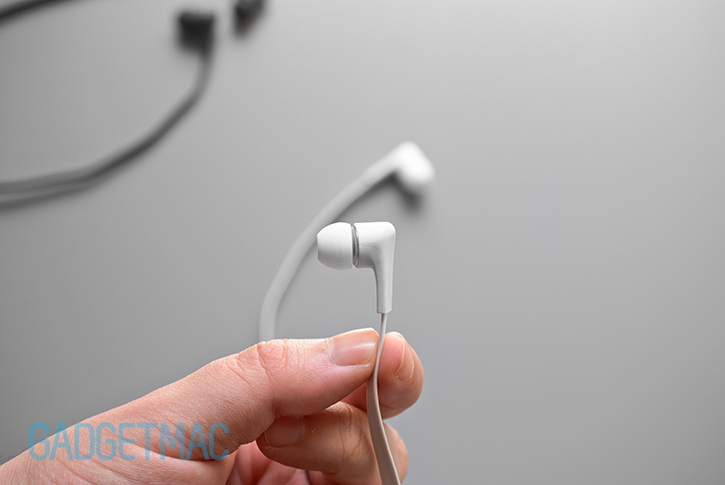 Fit has always been a controversial issue when it comes to in-ear headphones. Everyone seems to have a different take on how well these buds fit their ear canals. And unsurprisingly, the a-Jays Five have their own share of dislikes as a result of poor fitting. If you're an in-ear type person or one that finds any one of Jays in-ear headphones to be comfortable to wear inside your ears, chances are you'll also find that the a-Jays Five offer a great fit. And while they are very comfortable to wear, they're also very secure and have stayed inside my ears for prolong periods of time during intensive testing. So any cable tugging woes you may encounter won't cause the a-Jays Five to pop out so long as you found the right seal and fit. If you have trouble finding the right fit with the a-Jays Five using the supplied silicone tips, you should give the Comply T-200 foam tips a try – which are made out of an acoustic-isolating memory foam. They’re absolutely the best fitting tips you’ll ever try. Not only will they help isolate outside noise better than the stock tips included with the a-Jays Five, but they will adjust to the exact shape of your ear canal for maximum comfort that will feel like you’ve got a custom pair of in-ear monitors designed just for your ears. The caveat is that unlike silicone tips, there’s a limit to the number of uses you can get from using the same foam tips over and over again until they need to be replaced. The cost is obviously another factor you need to consider. Jays made the a-Jays Five with an emphasis on durability, which is evident in a number of aspects. Instead of making a fully exposed metal body like most other in-ear headphones, Jays engineered the body of the a-Jays Five as one seamless shape. What they've done was wrap a solid aluminum metal driver enclosure with a rubbery thermoplastic to create that angled ergonomic shape to each earbud whilst still retaining the strength and qualities of a metal construction with the added benefit of durable flexibility thanks to the thermoplastic cladding. As you can tell, the bottom stem portion of the earbuds where the cable stem is formed is entirely flexible whereas the rest of the body is essentially a rigid, lightweight metal construction underneath. 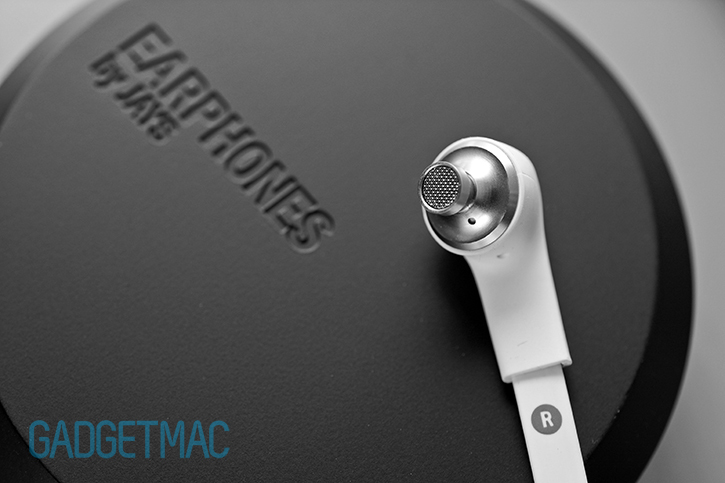 They look and feel like a high quality pair of polished, and carefully designed in-ear headphones that's for sure. But most importantly I think, the a-Jays Five are Jays most durable in-ear headphones Jays has ever created. The only minor drawback to this new thermoplastic build quality is that the matte finish does tend to attracts more lint and debris. Thought this really only applies to the black color of the a-Jays Five as it is much less of a noticeable issue with regards to the white flavor. 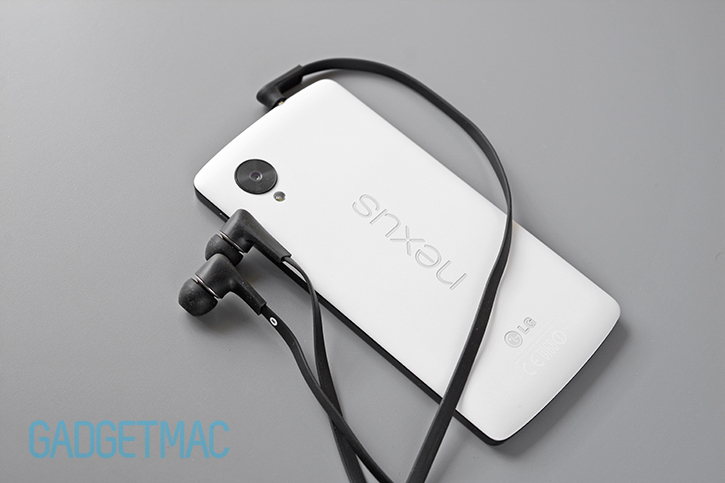 That superb flat, tangle-free cable is back. The iconic cable that made us like the a-Jays series even more is made tougher than before now with the a-Jays Five. And as much as that is true, there is one problem with introducing a more durable, and slightly thicker flat cable. While the a-Jays Five's flat cable is one of the best durable tangle-free cable we have tested, it isn't suited for use during intensive workouts. If you're going to be using these when you run or jog then you may really not like how the cable feels against your body as it swings about. Because of its flat shape and rubberized robustness, it is significantly more noticeable during intensive physical activities. Instead, you should consider a thin cable which is found on the t-Jays Five and Nocs NS600 Crush. That said, if you actually use the included clip to attach the cable to your shirt you can significantly improve the vibrating slack caused by the cable when you move around. It's also worth mentioning that the cable is long enough just so that you can place your device in your pocket without too much excess cable dangling around which is perfect for portable use as intended. What we considered to be the best inline remote control and mic module to ever be designed is now even better than before. Jays made the entire remote module thinner in size while giving the three buttons a boost in tactility by raising them up a tad more above the surface. Unchanged, and gladly for that matter, is the perfect balance of concave and convex button architecture which gives the user a defined sense of button placement and identification in a very subtle manner. The weight of the remote can hardly be felt as it is extremely lightweight. But as mentioned before, what you will notice is the tug of the flat cables. 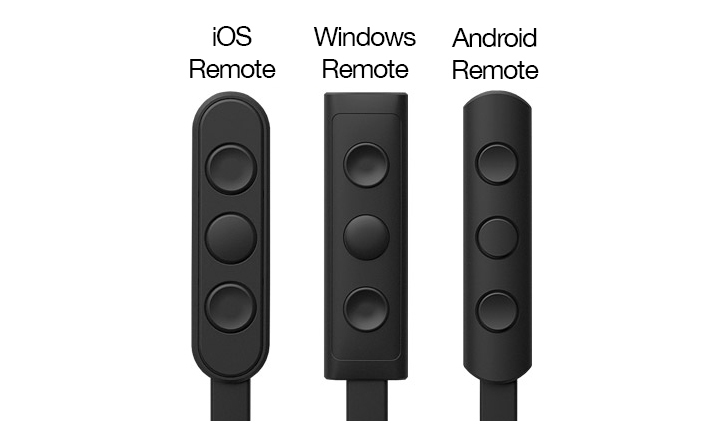 And of course now you have the option to choose from three different types of remotes that best work with your particular device and its own operating system form the likes of Android, iOS and Windows Phone. The remote modules vary from one OS support to the next. For comparison, we have a black Android-supported remote and a white iOS-supported remote. The difference between the two is merely in the shape of the enclosure. The same applies to the a-Jays Five remote for Windows Phone devices which features a Nokia Lumia-inspired design which is more squared. And no, white isn't exclusive to iOS. You can pick a white or black colored a-Jays Five for all three OS version. The iOS remote in particular is nearly identical to that of the a-Jays Four and t-Jays Four, except for the fact that it has lost that touch of a silver metal band around the module. It's all matte plastic sans a soft-touch coating to make it more durable under heavy use; and it still feels fantastic. The buttons are the same and deliver amazing tactile feedback when pressed. They're very responsive and more pronounced than before. You can use the 3-button remote to control things like music, volume, answer and end a call as well as OS-specific tasks. On Android devices this means that you would be able to control Google Now, Siri on iOS devices as well as Cortana on Windows Phone devices. Although we haven't tested Windows 8.1 Cortana functionality ourselves. And while we found that Apple's EarPods have a surprisingly better performing built-in mic that is superior when it comes to voice clarity and volume sensitivity, the a-Jays Five's built-in mic is still a good performer in it self. It does its best to deliver a clear sounding voice pick-up to the other end of the call whilst reducing unwanted ambient noise fairly well. But if we had to pick the best headset to use out of the two, the winner will have to be the EarPods. We noticed that Jays have also redesigned the 3.5mm plug to be less bulky compared to the a-Jays Four. It is now made out of the same thermoplastic rubbery material as the a-Jays Five themselves. And same as before, it fits into tight spaces and openings when using protective cases. The Jays branding was moved near the plug as oppose to being displayed to everyone whilst you wear the a-Jays Five. Not that we mind a bit of brand recognition. Jays isn't saying much about the drivers inside the a-Jays Five apart from calling them their A5 drivers. As far as we're concerned, there's nothing revolutionary about the a-Jays Five single dynamic driver unit. We suspect Jays is reusing the same 8.6 dynamic drivers from the a-Jays Four inside the Five all the while tweaking them a bit to sound more detailed across the mids and highs. Comparing the two side by side, there's a small yet noticeable difference in audio quality. Starting with the bass - which sounds a lot more defined, punchier and tighter than the a-Jays Four. The highs and midrange have also been improved and sound more bright, detailed and more defined just as Jays promised. But out of all the tweaking, I think that the a-Jays Five best the Four with much nicer sounding bass which is deep and satisfying in comparison. That being said, there's still room for more low-end kick and perhaps even more midrange definition. The sound signature isn't overly warm nor overly bright, but simply delightfully pleasant. Jays' similarly priced t-Jays Four unfortunately come with an iOS-only remote compatibility, but compared to the a-Jays Five, they've got an even deeper bass response that is thumpier and pumps a heavier low-end that enriches the sound signature with that extra dosage of audio excitement. The t-Jays Four are easier to drive, meaning they require a low volume to sound loud whereas with the a-Jays Five you'll find yourself turning up the volume until midway for a comfortable listening level with more alive bass – beit on your iMac or iPhone. Although we do think the t-Jays are Jays' best performing bass-centric model, the a-Jays Five are the company's best all-around sounding, most comfortable, and most durable contemporary in-ear headphones that arguably everyone is going to like. Even if you love your bass, you may want to spend a bit more to get the Nocs NS600 instead of the t-Jays Four. Because even though the bass is emphasized and plump, the midrange and highs aren't up to par. How do the Nocs NS600 stand up to Jays' flagship in-ear headphones then? The two Swedish brands seem like they could be one entity with an equal set of impressive product selection at reasonable prices. For starters, the a-Jays Five are arguably not as pretty as the NS600 and have a bulkier 3-button remote module to boot. Sonically, the NS600 are at an advantage due to their dual driver arrangement vs the single driver a-Jays Five. The difference between Nocs' NS600 and Jays' single driver a-Jays Five is purely a detail aspect. The NS600 have more of it, and that's not surprising. Both however, still perform just as well when it comes to a clear and clinically clean audio signature. If you think that the $50 premium is worth a more detailed midrange and slightly improved tonal bass response, then you'd be very pleased with what the NS600 deliver. They're only downside compared to the a-Jays Five is that they do have a more fragile audio cable and a partial aluminum covered plastic driver enclosure construction. As for the less expensive single driver Nocs NS400, while they are less costly than the a-Jays Five, are just as well built and have an equal set of features, we don't think they are as good to suggest as an alternative. Forget about the a-Jays Four, what you should purchase are Jays' best in-ear headphones the company has ever made - the a-Jays Five. With their superb build quality, smartphone-friendly fully featured remote and great audio quality, the a-Jays Five are a fantastic $100 in-ear headphones suitable for all types of music listening. Just don't expect to be blown away by their audio performance. You aren't getting more than you're paying for. Suffice it to say that as long as you find them comfortable to wear, the a-Jays Five offer a downright pleasing audio and mobile headset experience at a reasonable price. 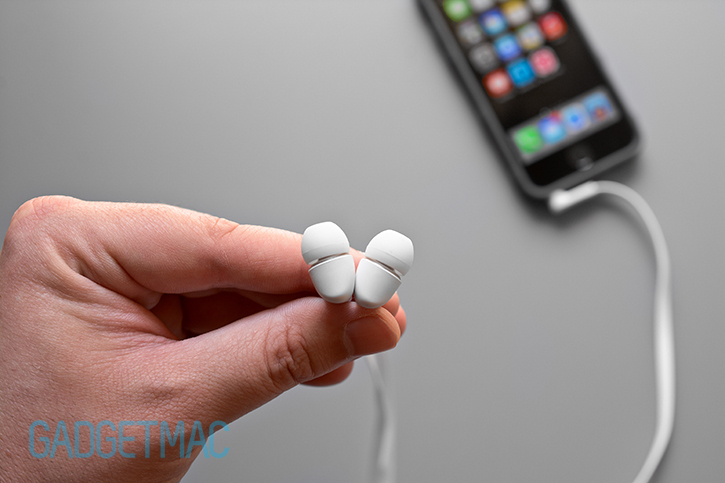 We enjoyed using them on a daily basis even without using optional fancy foam tips, and think any iOS, Android and Windows user will also appreciate what these in-ears have to offer. As a matter of fact, the a-Jays Five are good enough to highly recommend. Which is exactly what we have done. For the bass-head iOS user, someone who appreciates a dominating, thick low-end bass response closer to what full fledged headphones are capable of providing, the t-Jays Four are a worthy close second. And although it isn't very fair to compare a pricier pair of in-ear headphones, the $150 NS600 from Nocs are a noteworthy step up from both the a-Jays Five and t-Jays Four purely thanks to their superior dual-driver setup. And for those of you looking for a pair of in-ears to use during intensive physical activities such as running, we suggest that you pick the t-Jays or NS600 due to their lighter and thinner cabling.